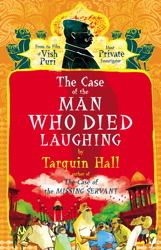 Visha Puri is a highly respected detective who one day gets called to investigate the death of a Dr. Jha who died while participating in the activities of the laughing club – a health practice. It seems that during the laughing session a Hindu goddess appeared from the heavenly mists and stuck a sword into him. Now … that gives one pause – there were many witnesses, it did happen. But how and why? This was a very enjoyable book, I chuckled many times with a few lol’s in there, too. Puri is smart and funny, the plot is complex and has a few twists but it all comes together in the end. I think I’ll listen to some more of Hall’s books. Now that sounds like entertainment to me. It’s very funny, too. The lead detective is a kick.